LOS ANGELES, Calif. – So, did you hear the one about God walking into the psychologist’s office? That is the premise of O My God, a brilliant, engaging 2012 Israeli play now being given its American premiere in Los Angeles. 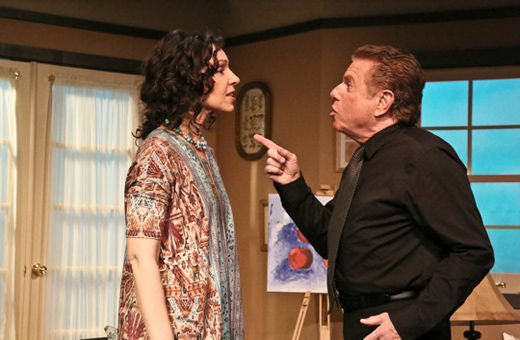 The West Coast Jewish Theatre artistic director, producer and stage director Howard Teichman looked high and low for an Israeli play to offer his L.A. audience, and came across this one, by Anat Gov, a popular TV and theater writer. O My God was voted the best play in Israel for the year 2012, though sadly the author died the same year from cancer at 55. If you’re familiar with the concept of the 50-minute hour – the standard psychiatrist’s hour-long session – well, this is the 90-minute hour, a rollicking trip through the mind of God who, being a busy guy, needs to wrap it all up in one appointment. Amazingly, and against her own expectation, Ella succeeds. A “divine comedy” indeed, as the show’s blurb promises. God, played with ironic authority by the international star Mike Burstyn (he starred in Barnum on Broadway, among a long list of other accomplishments), has been depressed. For 2000 years, give or take a thousand. At first Ella can’t accept that this is really God in her office. Who would? After all, the Holy Land is generously populated by biblical psychotic wackjobs of every conceivable denomination. So God has to perform a little prestidigitation to convince her, stuff as simple as opening and closing doors with the wave of his hand, freezing her in place for a minute, like Lot’s wife, and other dime store magic tricks. Kudos to the lighting designer Gil Tordjman for his, uh, heavenly effects. Given the shortage of time, Ella gets down to work on her new client, observing that without any parents or friends, he must have been pretty lonely, and had no life experience to guide him when creating human beings to be his companions. What were his expectations of them? She runs through a checklist of all the expected, and many unexpected insights a shrink might ask of a patient, the usual ones about love and abandonment, of course, as well as others that from her modern, secular point of view, challenge the very all-powerful “godliness” of God. Ms. Gov shows a keen knowledge of the biblical texts that show God to be a complex and troubled character at best, and at worst a bellowing bully lording his authority over everyone and everything he’s created. I learned a lot from her play: For example, I did not know (did you?) that the Book of Job is the last time (at least in the Hebrew scriptures, I’m not sure about the New Testament) that God speaks – and man, what a speech that is! You know, the one that self-importantly puts poor Job in his craven, sniveling place, by contrast to the majestic, fantastic, supernatural feats God has achieved. Burstyn delivers this passage in the original biblical Hebrew in stentorian tones worthy of a Mafioso not accustomed to being challenged. The Book of Job is also the only place in Hebrew scripture that refers to Satan – whom, of course, God must have created, right? “What was there in Job that awakened your Satan?” the probing Ella asks. In other words, she accommodates to God appearing in her office, and then proceeds to treat him empathically but rationally and clinically like any other patient in trouble. Ella is played by a versatile and totally believable Maria Spassoff. Not at all incidentally, O My God is as much about Ella as it is about God. She has her own constellation of “issues.” For one thing, she has a 17-year-old son, Lior, who is severely autistic. He grunts and vocalizes but cannot form words. Yet, he is an accomplished cellist and a painter, whom Ella has learned to accept as a gift in her life. As the old Jewish saying goes, God couldn’t be everywhere, so he made mothers. The third actor in the play is Lior, performed by the young Joseph Rishik, who plays a mean cello and offers a fully realized interpretation of his difficult character. Set design by Kurtis Bedford is a perfect representation of the controlled chaos of life, and Howard Teichman’s direction is crisp, spot-on, and exploits the multitude of laugh lines with warm grace. I’ve rarely spent a 90-minute hour so scintillating and sparkling with wit and wisdom as this.